Verbal Altercation Between Al-Maliki and Talabani Behind the last Health Decline!!! A source close to the President that the verbal altercation occurred last night between Prime Minister Nuri al-Maliki and President Jalal Talabani, is behind the collapse of President’s health. The source added that the Prime Minister had yesterday evening visited the President at his Office and the two sides discussed the crisis between Baghdad and Kurdistan, and during the meeting scuffled as illiteracy among Maliki and President Talabani who has shown more than once its objection to the method adopted by the Government in addressing the outstanding files and language of escalation and the threat, which was met with a violent response by the territory’s prime responsibility for the conflict, urging the President to deal with the neutral and non-aligned to nationality . This is because in the troubled President who stated his support for Al-Maliki and standing next to it in confidence crisis and not standing by his ally Barzani, but Al-Maliki replied that a lack of confidence was draining for Talabani before flowing into valid, accused Talabani of the Kurdish rivals multiplies and restore influence in the territory . The source said according to the site “Shatt” that the President ended the meeting with the Prime Minister and demanded renewed consideration of positions, and following the departure of the Prime Minister’s close associates from the Taliban complained his headache, and then the evolution of his condition and a sudden coma and was taken to the medical city at night . The source revealed that the President entered the stage of clinical death and doctors said as result of stroke as a result of nervous emotion and high blood pressure, and no hope of continuing the life of the President only by miracle. 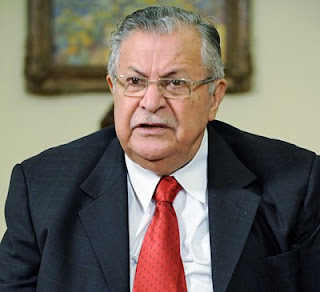 This entry was posted in Direct Source, HOT TOPICS, LJ's Next Step, NEWS, Talabani and tagged Baghdad, Jalal Talabani, Kurdistan, maliki, Massoud Barzani, Nouri al-Maliki, Talabani by MrIQD.com. Bookmark the permalink.